A. Does your agency know who your stakeholders are? B. Have you identified gaps and set priorities for strengthening relationships with stakeholders? C. Does your agency know the key stakeholders’ priorities, capacities, and desires for partnership on TZD? D. Is there mutual trust and respect between your agency and key stakeholders? E. Do your stakeholder relationships provide a net advantage to you and your partners? A. Does your agency have a general plan for communication or outreach to stakeholders? B. Does your agency have goals for engaging beyond basic communication with stakeholders? C. Does your agency differentiate your engagement strategies to accomplish different goals (e.g., gathering information vs. building buy-in)? D. Is your agency effectively mobilizing methods, resources, and activities to fulfill your different engagement goals? E. Does your agency periodically assess your engagement activities and recalibrate to improve? A. Does your agency have dedicated staff or a consulting budget for communication and outreach? B. Does your agency have resources (tools, staff, funding) for general TZD-oriented communication and outreach? C. Does your agency have resources for targeted TZD-oriented communication and outreach with differentiated audiences and stakeholders? D. Does your agency’s staff have skills and resources for supporting collaboration as well as outreach? E. Does your agency support skill-building or cross-training for TZD activities among stakeholders? A. Informing: Are your key stakeholders aware of your state goals and activities? B. Participation: Do key stakeholders provide input to and influence TZD activities in the state? C. Collaboration: Do key stakeholders help to implement TZD activities in the state? D. Adaptive, shared management: Is your agency part of a well-coordinated TZD network of many active, committed actors in the state? E. Inclusion: Do key stakeholders help set priorities, design and implement programs, and measure TZD activities in the state? A. Do your agency and key partners share and review crash data? B. Do your agency and key partners have shared metrics for setting and monitoring progress toward goals? C. Do your agency and key partners use the data and metrics to identify safety issues and potential resolutions? D. Do your agency and key partners utilize the data to respond proactively, as well as reactively, to pursue progress on shared metrics? E. Are your agency and key partners achieving progress on short- and long- term shared metrics? A. Burnout: Has your agency avoided situations where communication or engagement efforts seem to cause more trouble than they are worth? B. Resource-intensive: Do your agency’s TZD engagement efforts generate at least as many resources as they consume? C. Net benefit: Do your agency’s TZD engagement efforts provide benefits to collective TZD efforts? D. Collaborative advantage: Do your stakeholder relationships provide a net advantage to you and your partners? E. Collective impact: Do your agency’s TZD engagement and collaboration efforts amplify and enhance your positive, collective impact to reduce deaths? Why: To have effective relationships with stakeholders and to mobilize your relationships toward progress on TZD goals, you need to know who your stakeholders are. Stakeholders are groups or organizations that have a strong influence over or interest in the achievement of TZD goals. Influence can take the form of legal authority, data, resources (funding, human resources), or political power that would affect how well TZD goals are met. Stakeholders may have formal or informal power to support, obstruct, or renegotiate TZD goals. Those with an interest include groups affected by the program’s success, such as people who use the roads or organizations given resources to implement some part of the TZD strategy. How: A good way to identify stakeholders is to brainstorm a list with a small group of your colleagues, using the simple 5-step process described on pages 28-29 of “What to do when stakeholders matter” (Bryson 2004). This short and fun instructive video, which offers ideas about how to recognize the important TZD players in your region, is also a good resource. Finally, read about how to identify potential partners in the How-To Guide: Implementing the TZD Strategic Communication Plan. Image Source: Carlos Serra, 12/2014. This approach was originally developed in Eden & Ackermann 1998. Why: Building relationships with stakeholders is worthwhile, but it takes a lot of effort. You need to be strategic. Without a strategy, you may neglect important constituents, give some stakeholders too much attention, or simply waste effort. How: The first step is to create an influence vs. interest grid, like this. Assign your individual stakeholders (or types of stakeholders) to each section of the grid. Then, evaluate whether you are giving an effective level of attention to each stakeholder. Use the guidance in this grid to adjust your outreach efforts accordingly. For a how-to guide, see Bryson (2004). Why: Strong partnerships develop through aligning the different participants’ interests and abilities. Knowing and encouraging your partners’ unique priorities, constituencies, capacities, and desires will help you to mobilize their contributions to TZD. Finding these synergies will strengthen the functioning and impact of the TZD stakeholder “team” as a whole. How: This strategy has two parts. The first is to know the TZD stakeholders. At least once annually, ask each key stakeholder about their priorities, capacities, and needs and explore potential synergies. Periodically convene meetings of key stakeholders to discuss your individual and shared priorities, capacities, and needs. The second part of this strategy is to use your role as a TZD leader to strengthen the resources and complementarities of the TZD team as a whole. As the lead agency, help identify shared goals. Amplify your stakeholders’ capacities by offering support (financial, technical assistance) or even voicing your support. Find more resources and direct them to where they will be most effective. Why: Most public managers understand very well that trust is essential to strong partnerships—and probably have experienced the difficulty of working in situations where trust is weak or has been violated. Building or restoring trust takes a great deal of effort and may seem mysterious or overwhelming, but some useful tools are available to guide your success. Why: Working with stakeholders requires attention, staff time, and money. The desirable situation is “collaborative advantage,” in which the partners make net progress toward a shared goal that they couldn’t have accomplished alone. Effective partnerships can generate desirable and even unexpected resources through greater efficiency, creative problem solving, or strengthened political support. Aim for the advantages of added resources for at least some partners, increasing the reach of TZD messages and efforts through stakeholders’ relationships with their constituency groups, and reducing deaths. How: Using shared metrics is a good way to measure—and adjust—the relationships and activities in your partnerships you want to promote. Continually revisit Steps 1A–1D of this matrix to find opportunities to revisit your connections with current and potential stakeholders, customize your outreach to different kinds of stakeholders, maximize opportunities to take advantage of mutual or complementary skills and interests, and strengthen trust. Why: A necessary foundation for any productive work with stakeholders is effective communication about your work—meaning that you communicate regularly and provide relevant and helpful information. How: To communicate effectively, you must first be aware of who your stakeholders are and understand their needs and desires for information. What TZD goals and metrics will they be most interested in? Second, you need a communication plan and basic resources to implement it. Why: Preferably, your engagement strategy consists not only of pushing out information, but also of more extensive outreach, tailored to different kinds of stakeholders, to build awareness about TZD activities and goals of interest to them. This kind of outreach cannot be accomplished through uni-directional efforts by your agency to share information; it is built instead through sustained, bi-directional relationships. How: Effective outreach involves recognizing the differences among your stakeholders and varying how you communicate with them accordingly. For example, some TZD partners may be especially interested in behavioral interventions and others in emergency response. Once you recognize those differences, create more detailed outreach strategies and specialized communication materials and platforms. Also allocate staff time and budget to refresh information and to build and sustain relationships. Why: Quite often, agencies do not pause to articulate their goals for engagement. Unfortunately, a standard “one-size-fits-all” design often leads to ineffective engagement, wasted resources, and even damaged relationships. For example, a goal of meeting a legal requirement to be transparent to the public is quite different from a goal of working with stakeholders to gather input to support a well-informed TZD program design, which in turn is quite different from a goal of building and sustaining relationships with partners to increase buy-in and collaboration. How: Peruse the list of possible goals in Table 2 of these design guidelines for engagement. Keep in mind that you may have multiple goals for your stakeholder partnerships. They may be different for different stakeholders and they may change over time. Therefore, pause frequently—using this table as a prompt —to revisit your goals for any given stakeholder engagement effort. 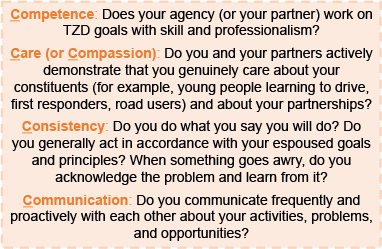 You may also want to review the “Benefits for specific partner engagement” table in the How-To Guide: Implementing the TZD Strategic Communication Plan. Your next step is to choose the methods and resources for meeting each goal. Why: A standard “one-size-fits-all” approach to engagement will not accomplish your TZD goals effectively and efficiently. If your goal is to meet legal requirements for transparency, straightforward public notices will suffice. On the other hand, if your goal is to sustain a network of partners to recognize and proactively address emerging traffic safety risks, you need to invest in convening stakeholders regularly to review crash data, monitor progress on shared metrics, and revisit priorities. The second goal requires sustained attention and expert judgement from agency staff, but those resources would be wasted on the first goal. How: Once you have clarified your goal(s) for any stakeholder engagement effort, use Table 2 of these design guidelines for engagement to select the engagement strategies that align best with those goals. Table 1 of this review of engagement efforts provides examples of innovative approaches from U.S. transportation agencies. Once you have decided on the best methods—for example, small-group consultations or large public meetings—create a schedule, staffing plan, and budget. Why: Stakeholder engagement takes a lot of attention, and your agency will want to evaluate whether your efforts are effective. Frequent evaluation, using appropriate measures of success, will help you to make timely, data-based decisions about what engagement activities to sustain and how to improve or change to be more effective. Common evaluative measures focus on throughput and output (such as the number of announcements sent out, stakeholder meetings held, or meeting participants), but it is more desirable to measure outcomes (such as whether key stakeholders are aware of and working to advance TZD goals). How: Use the final column of Table 2 of these design guidelines for engagement to select the evaluative metrics that best suit your stakeholder engagement goals and methods. Collect and analyze the data, then refine your engagement activities to improve your outcomes. Why: The recommendations in this matrix for improving outcomes from stakeholder engagement are untenable without the necessary resources. The benefits of engagement typically increase with the level of engagement. No work can be accomplished without some commitment for your staff to be involved in the work. How: Consider your human resource needs for building relationships, outreach, or technical assistance. Do you have resources in place within your agency or through some consulting or contracting arrangement? More information is available in the How-To Guide: Implementing the TZD Strategic Communication Plan. B. Does your agency have resources for general TZD-oriented communication and outreach? Why: The recommendations in this matrix for improving outcomes from stakeholder engagement are untenable without the necessary resources. The benefits of engagement typically increase with the level of engagement. To realize the benefits, your agency must have, as appropriate, dedicated resources to do the work. How: Review your stakeholder partnership goals and strategies. What kind of resources are needed, and when? Once you have considered the resources needed for building relationships, outreach and communication, or specialized areas of technical assistance, evaluate whether your current resources are adequate. Do you have them in place within your agency or through some consulting or contracting arrangement? Also, consider material needs for outreach such as mileage, staff time, print materials, and website presence. Do you have the time and budget for implementation? 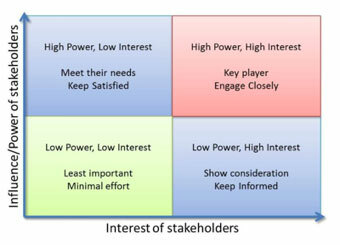 Why: Other parts of this matrix can help you to identify different stakeholders and their particular needs and interests. Your agency needs resources to address. For example, even if your goal is simply to communicate information, you may need to provide it in multiple languages or in different formats—such as printed materials, video, social media messaging, or live presentations—for audiences with varying levels of technical knowledge. How: Reevaluate the particular needs and interests of your potential partners for accomplishing your most important TZD goals. What would effective communication and partnership with them look like for each group of relationships? What kinds of resources—such as staff, consultants, time, budget, translators, or print materials—do you need? D. Does your agency's staff have skills and resources for supporting collaboration as well as outreach? Why: Basic communication with stakeholders about TZD goals and programs can be accomplished more efficiently and uniformly than more intensive levels of interaction and partnership. Greater levels of engagement reap more benefits but require a higher level of ongoing, dedicated effort to build and sustain relationships and respond to stakeholders. How: Revisit your goals and the level of engagement you would like for your stakeholder engagement efforts. Consider the message of the IAP2 Spectrum of Public Participation: It is critical to align expectations about the level of involvement and influence with your agency's actual resources and openness to partnership. If you do want to collaborate, consider if your staff has relationship-building skills, performance goals that legitimize their investment in this work, and the time and budget to be present as collaborators. Why: As you increase levels of partnership with your stakeholders, you expand your capacities. By building competence for your high-priority, core TZD areas across your stakeholders, you expand your reach and effectiveness in those priority areas. One of the benefits of rich collaboration is that the partners bring their own particular strengths to the TZD work. For example, some may be particularly skilled in public education for injury prevention, while others may be particularly well connected with a high-priority group for your outreach activities. General—What kinds of skills do you need most to maximize the reach and effectiveness of your highest-priority, core TZD areas? Create regular (perhaps annual) opportunities to train together in these areas. This keeps attention on the priorities, strengthens relationships, and builds capacity. Specialization—Do some of your partners have essential skills or connections with especially important constituencies for your TZD efforts? Ask them to lead specialized trainings or to invite you and your partners to periodically participate in their trainings. A. Informing: Are your key stakeholders aware of your stated goals and activities? Why: It's important to be clear—within your agency and with your stakeholders—about the kind of involvement you are inviting and the level of influence your stakeholders will have. Otherwise, your agency may inadvertently imply (or stakeholders may infer) that stakeholders will have more influence than they actually will. This kind of misunderstanding often damages trust. How: Cells 4A–4E of this matrix denote increasing levels of stakeholder engagement in and influence over TZD goal setting, resource allocations, and programming decisions. The IAP2 Spectrum of Public Participation describes different levels of engagement and suggests how to communicate about them; it also makes clear that a greater level of engagement is not necessarily desirable. Even the most modest level of engagement should be on the spectrum: at a minimum, inform stakeholders about TZD goals and activities so that you are acting transparently and that stakeholders know where to go for more information and how to get involved. An example of a one-page handout with this type of information is available in the How-To Guide: Implementing the TZD Strategic Communication Plan. Why: It's important to be clear—within your agency and with your stakeholders—about the kind of involvement you are inviting and the level of influence your stakeholders will have. Any invitation to "participate" emphasizes the opportunity to provide input on proposed priorities or actions. How: Successful, high participation requires your agency to 1) Actively advertise opportunities and encourage stakeholders to provide input; remove barriers and be accessible so that many stakeholders with diverse backgrounds do participate. For example, you could choose meeting times and locations that are accessible, provide language translation or childcare, or use a combination of social and traditional media. 2) Gather and act on input. A "window dressing" exercise of taking in input—without actually using it—will damage relationships. Why: Collaboration means "working together." Your agency probably depends on stakeholders to develop and implement good TZD programs, while they may depend on your agency to set conducive policies and provide leadership, technical assistance, or funding. You can accomplish more toward your shared interests if you intentionally collaborate. Analyze whether and how you and your key stakeholders are interdependent. Identify the areas for which it would be most useful to coordinate your TZD activities on an ongoing basis. This is not a one-size-fits-all approach. For example, you may collaborate with injury prevention and law enforcement officers on driver education, but with a different group of engineering agencies on improving road conditions. An example of successful collaborations is included in the How-To Guide: Implementing the TZD Strategic Communication Plan. Why: Adaptive management is well suited to problems like those of TZD: high-stakes issues for which new safety risks may continually emerge, the effects of interventions are not well known, or you want to speed up the cycle of evaluating needs and programs to adjust activities and improve performance. Adaptive management is a very high level of stakeholder influence, akin to the "empowerment" level in the IAP2 Spectrum of Public Participation. How: Consider how challenging the TZD issues are and what can be gained from sharing control. If the situation merits sharing control and investing in program goal setting and data monitoring by the group, take an adaptive, shared management approach. Why: "Inclusion" is an intensive and highly productive level of engagement. It goes well beyond providing opportunities to "participate" by allowing input on proposed TZD activities. Instead, it is a bi-directional relationship of mutually strong influence. How: Successful, high inclusion requires your agency to be open to defining the key problems and the process for collaboration—as well as the policies, resource allocations, and activities you will undertake—in conjunction with your stakeholders. Inclusion reduces the level of control you have as the lead agency; conversely, it reduces the burden on your agency to do most of the work and bear the risk of ending up with beautiful solutions to the wrong problems. 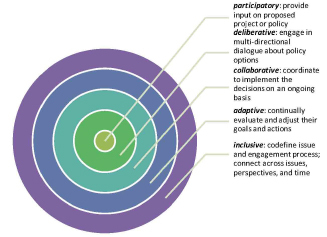 Recheck the IAP2 Spectrum of Public Participation to consider whether this is a desirable, appropriate level of stakeholder engagement and influence for some parts of your TZD work. Why: Systematic data collection and analysis allow you and your stakeholders to identify problems and gain a common understanding of the key issues. This will help you to determine and prioritize your TZD activities. How: This recent NHTSA report describes the kinds of data collection and analysis you could conduct to detect key problems and emerging trends and to measure the effectiveness of countermeasures. This NCHRP study offers suggestions for developing an injury measurement and reporting system. Why: Developing shared metrics obviously supports sharing data and monitoring trends. Just as important, creating shared metrics is considered one of the 5 key foundations for effective collaboration because it facilitates creating a shared understanding of the key issues and a shared agenda of priorities and goals. How: Federal law requires DOTs, SOHS, and MPOs to each set annual targets for safety performance measures. Although DOTs and SOHSs have three performance measures that must have identical targets, both agencies are allowed to set individual targets for additional safety performance measures. Agencies coordinating on a TZD-related program goal should understand what targets are being selected for federal safety performance measures. If the agencies are setting targets that are higher based on an upward trend line, then the TZD coalition partners need to understand that fatalities or serious injuries are predicted to increase and that change is needed to decrease fatal and serious injuries. As a resource, this recent NHTSA report describes the kinds of data collection and analysis you could conduct to detect key problems and emerging trends and to measure the effectiveness of countermeasures. This NCHRP study offers suggestions for developing an injury measurement and reporting system. Consider metrics focused on TZD outcomes (e.g., fatalities, seat belt use rate, impaired driving rate) and output (e.g., miles of rumble strips, hours of targeted patrol, presentations/demonstrations to high schools). Why: Evaluating your data and metrics allows you and your partners to recognize emerging trends—such as cell phone texting as a new source of distracted driving—so that you can address them in a timely way. It also provides feedback on the effectiveness of countermeasures you and your partners are trying so that you can improve your TZD efforts. How: This recent NHTSA report describes the kinds of data collection and analysis you could conduct to detect key issues and emerging trends and to measure the effectiveness of countermeasures. This NCHRP study offers suggestions for developing an injury measurement and reporting system. Consider creating a traffic safety dashboard to provide the public and stakeholders with an overview of traffic safety trends (for an example, see the State of Kansas dashboard). Why: TZD efforts are more effective when you use the data to identify emerging trends and act in a timely manner with interventions to address new safety issues. Reactive responses—such as identifying a new hot spot with multiple crashes or observing whether rates of impaired driving are increasing or decreasing—will also help you to evaluate the effectiveness of your TZD efforts and to redirect resources where they are most needed. As noted, its good to include metrics on outputs (e.g., miles of rumble strips) as well as outcomes (e.g., reduced fatalities), because progress on outcomes typically follows progress on outputs. Tracking the output metrics sets goals and evaluation measures for agency actions and also provides the foundation for gauging their impacts on outcomes. E. Are your agency and key partners achieving progress on short- and long-term shared metrics? Why: This matrix includes many process-oriented suggestions and measures for improving the success of your stakeholder engagement efforts. Obviously, however, the point of your stakeholder efforts is to reduce deaths, so measuring progress on that outcome is paramount. How: Review your goals and metrics. Do you have both long-term and short-term goals, and do you have shared metrics for evaluating progress toward them? If not, fill those gaps. Evaluate progress on the metrics as a routine part of your meetings with stakeholders to review crash data. A. Burnout: Has your agency avoided situations for which communication or engagement efforts seem to cause more trouble than they are worth? Why: Often, it seems that engagement is more trouble than it’s worth. Maybe the effort does not seem to yield much benefit, which leads to burnout. In worse cases, when engagement goes awry, it may cause long-term damage to partnerships or the legitimacy of the program. How: Use evaluation tools to analyze how your communication and engagement efforts are working. Use Table 2 of these design guidelines for engagement to revisit your goals. Often, if engagement efforts are not going well, it’s because the goals are not clear or the methods are not aligned with the goals. Why: There is no question that stakeholder engagement consumes agency budgets, staff and volunteer time, technical assistance resources, and information infrastructure. Sometimes it seems that those resources might be better directed toward project implementation. How: However, stakeholders can also contribute and generate resources for program planning implementation, including new information and perspectives, motivation and actions to address problems, improved reach for programs, and legitimacy. Why: The lead TZD agency may invest considerable resources in mobilizing and coordinating TZD efforts by a group of partners. This effort is worthwhile to the extent that it amplifies or accelerates the work of your network. That’s why it is necessary to regularly evaluate TZD efforts to assess and improve the return on that coordinating effort. Stakeholders can also contribute and generate resources for program planning implementation, including new information and perspectives, motivation and actions to address problems, improved reach for programs, and legitimacy. embracing a more inclusive approach to your partnerships so that you are sharing responsibility for defining and prioritizing problems, creating mutually responsive relationships, and creating and implementing programs. Why: Working with stakeholders requires attention, staff time, and money. The desirable situation is “collaborative advantage,” in which the partners make net progress toward a shared goal that they couldn’t have accomplished alone. Effective partnerships can generate desirable and even unexpected resources through greater efficiency, creative problem solving, or strengthened political support. Some of the important advantages to aim for are adding resources for at least some partners, increasing the reach of TZD messages and efforts through stakeholders’ relationships with their constituency groups, and reducing deaths. Why: An ideal outcome of stakeholder engagement is that, through your communication, outreach, and partnership, you accomplish “collective impact.” This means that the sum of the contributions you and your partners make to TZD efforts produce benefits—for reducing deaths—that are greater than what you could have accomplished individually. How: This entire matrix is designed to support your progress toward this ideal outcome. It should help you direct your resources and efforts to build constructive relationships, enhance the reach of the efforts you and your partners make, and make progress toward reducing deaths. You will have a good sense of how well your engagement efforts are going—and adjust accordingly. However, to accelerate your collective impact, pay special attention to creating shared metrics, evaluating your progress, and adapting your strategies accordingly. Using ambassadors to help spread the TZD message is one example of this collective impact. This assessment is designed to show you where your organization is on the spectrum of six practices that support stakeholder involvement with TZD efforts. You will receive a printable report highlighting your responses when you finish the assessment. Does your agency know who your stakeholders are? Have you identified gaps and set priorities for strengthening relationships with stakeholders? Does your agency know the key stakeholders’ priorities, capacities, and desires for partnership on TZD? Is there mutual trust and respect between your agency and key stakeholders? Do your stakeholder relationships provide a net advantage to you and your partners? Does your agency have a general plan for communication or outreach to stakeholders? Does your agency have goals for engaging beyond basic communication with stakeholders? Does your agency differentiate your engagement strategies to accomplish different goals (e.g., gathering information vs. building buy-in)? Is your agency effectively mobilizing methods, resources, and activities to fulfill your different engagement goals? Does your agency periodically assess your engagement activities and recalibrate to improve? Does your agency have dedicated staff or a consulting budget for communication and outreach? Does your agency have resources (tools, staff, funding) for general TZD-oriented communication and outreach? Does your agency have resources for targeted TZD-oriented communication and outreach with differentiated audiences and stakeholders? Does your agency’s staff have skills and resources for supporting collaboration as well as outreach? Does your agency support skill-building or cross-training for TZD activities among stakeholders? Informing: Are your key stakeholders aware of your state goals and activities? Participation: Do key stakeholders provide input to and influence TZD activities in the state? Collaboration: Do key stakeholders help to implement TZD activities in the state? Adaptive, shared management: Is your agency part of a well-coordinated TZD network of many active, committed actors in the state? Inclusion: Do key stakeholders help set priorities, design and implement programs, and measure TZD activities in the state? Do your agency and key partners share and review crash data? Do your agency and key partners have shared metrics for setting and monitoring progress towarsvn updated goals? Do your agency and key partners use the data and metrics to identify safety issues and potential resolutions? Do your agency and key partners utilize the data to respond proactively, as well as reactively, to pursue progress on shared metrics? Are your agency and key partners achieving progress on short- and long- term shared metrics? Burnout: Has your agency avoided situations where communication or engagement efforts seem to cause more trouble than they are worth? Resource-intensive: Do your agency’s TZD engagement efforts generate at least as many resources as they consume? Net benefit: Do your agency’s TZD engagement efforts provide benefits to collective TZD efforts? Collaborative advantage: Do your stakeholder relationships provide a net advantage to you and your partners? Collective impact: Do your state’s TZD engagement and collaboration efforts amplify and enhance your positive, collective impact to reduce deaths?